Hi Folks! 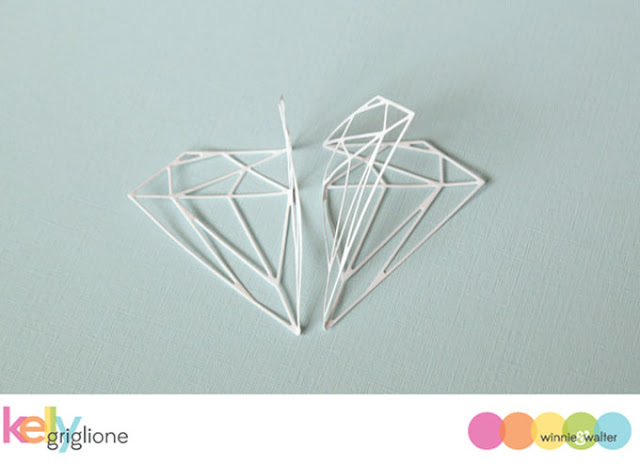 Kelly here to show you something I'm really excited about ... 3D shapes with Winnie & Walter's new faceted cutaways! Circle, star, heart and even diamond cutaways are now available, and while they are really fun to use right out of the die cutter, they are also quite interesting to use as a 3D shape. Let's take a look! This is the Flawless Diamond Cutaways that has been converted to a 3D element. With an element this graphic, I think it's all you really need for an impressive engagement card. To convert any die to a 3D shape like this, you need to do three things 1) cut many of them, 2) fold them down the middle, and 3) glue the halves together. Here are two of the seven diamonds I cut for this card, with the one on the right folded down the middle. After all of the shapes are folded, the halves need to be lined up and glued together. That's it! The more shapes you use, the fuller the 3D element gets. I made a gif file to better show what the card looks like as you turn it around. I love looking through the spaces to see all the different lines. 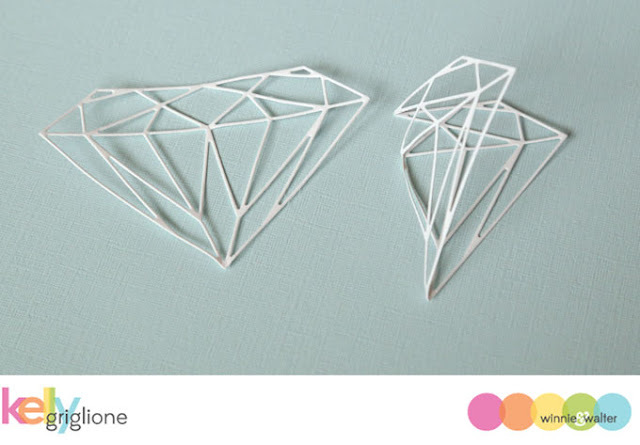 An intricate die cut like this with lots of open spaces is a great candidate for making an impressive 3D element. Another nice feature of this card is that it folds down very easily to make it mail-friendly. The sparkly "congrats" sentiment (from The Big, The Bold and You) is hooked on one of the facet outlines with the top curve of the "c" and the "a." I put a dab of glue behind to secure them. I would love to see what interesting 3D shapes you can make with your dies! I'll be back next Friday with a 3D project made with the Flawless Heart Cutaway. Hope you can check it out! OMG! This is fabulous, Kelly! What an impressive card! 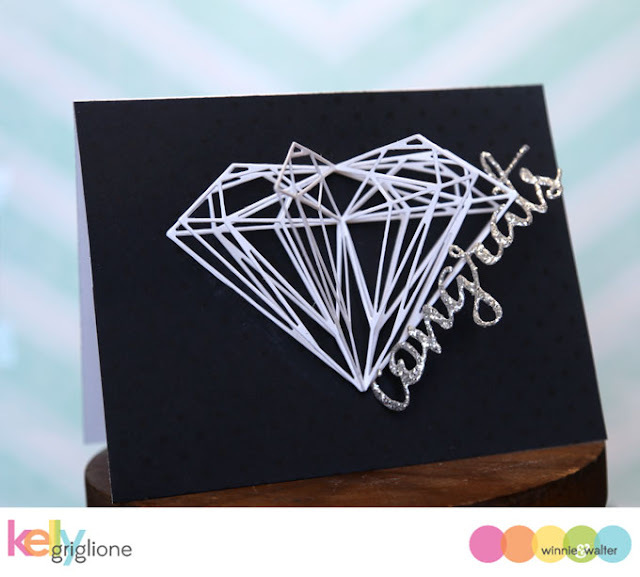 Your card is AMAZING Kelly - LOVE the delicate dimension!!! PS - there are rumours that there is going to be an engagement soon in our family, so I am feeling TOTALLY INSPIRED!!! Oh Tracy, big CONGRATS to you and your family!! Wow, that looks absolutely stunning! Absolutely stunning, Kelly, and clever. What an amazing card, Kelly! This is a great idea to add gorgeous dimension that you can send flat in the mail, besides, I love the floating "congrats" word die!